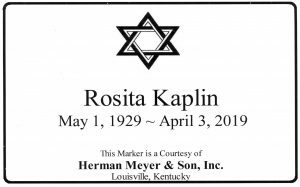 Rosita U. Kaplin, 89 – Herman Meyer and Son, Inc.
Ros­ita Uroper Kaplin, 89, passed away peacefully on Wednesday, April 3, 2019 at Norton Au­dubon Hospital in Lou­isville. Rosita was born on May 1, 1929 in Havana, Cuba. She emigrated to the United States with her mother in 1944 and settled in Louisville, there she met the love of her life, Phil (Pinky) Kaplin, and they married in 1950. They were happily married for over 60 years until Pinky’s passing in 2012. Rosita was a resident of Grove Point at the Masonic Home in Louisville. Rosita was a devoted and loving wife, mother, grandmother, great-grandmother and friend. Her family was always the most important thing in her life, and they could always count on Rosita to be there for them. Rosita was an active mem­ber of the Senior Adult Program at the Jewish Community Center in Louisville where she had many friends. In 2015, she was the proud re­cipient of the Elsie P. Judah Memorial Award for outstanding volunteer service. Rosita was predeceased by her father, Jack Uroper, her mother, Basia Uroper and her hus­band, Phil (Pinky) Kaplin. 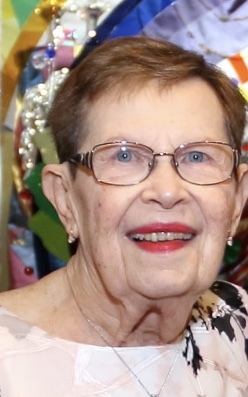 She is survived by her daughter, Jackie Posnansky (Mark), son Cary Kaplin (Laurie), grandchildren Brian Posnan­sky (Rebekah), Nikki Posnansky King (Ted), Ben Kaplin (Sharon), Nathan Kaplin and great-grandchildren Lilly King, Seth Posnansky and Philip Kaplin. Graveside services will be held at the Anshei Sfard Cemetery in Louisville on Friday April 5, 2019 at 11:00 a.m. Expressions of sympathy may be made to the Senior Center of the Jewish Community Center in Louisville, Temple Shalom, the Parkinson’s Support Center of Kentucky or the donor’s fa­vorite charity.